We have juice! When we stopped in Tampa, Hallie and Chris had a Champion Juicer that they were looking to trade…so we acquired this beautiful beast of a juicer and have been enjoying it. I made a large batch of green lemonade recently, and it just made me soooooo happy. I love the “buzz” I get from green juice (it’s way better than a coffee buzz!). Paired with a big green salad, it’s a very filling meal. In such a small space, it’s rather messy to clean up the juicer afterward…so we don’t use it every day. But I love having the option. And now I can make Magic Carrot Juice whenever my little heart desires…happiness in a cup! Entry filed under: Juices, Juicing, Raw. Cool I have the volkswagen bus of Juicers too! 😀 Love the blog! I am happy you got a juicer!! I just sat down with my own mason jar of green lemonade! MMM. I am looking forward to trying the Magic Carrot Juice too. I have just recently found your blog and look forward to all the inspiration! I’ve been making green smoothies for the family for a while now (and they all really like it), but I have to admit that I like my green lemonade better! That’s a cute picture, btw! this is to comment on the Macaroons. I made them and froze them like you said. And they didn’t turn out like I thought they would not really sweet. So what I did is i used two bananas, 1 cup of almond milk, some honey, and enough frozen macaroons in the blender to have it like a chocolate milk shake it was sooooo good. hope you can try it. My family and I are veggies but I started the raw food thing on Easter and am doing good. I feel great. thanks for all your great wisdom. Keep spreading the love. I found your website by sheer accident and I am so glad I did! I am enjoying it soooo much! 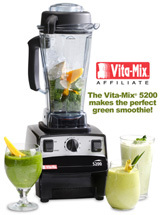 I own a Vita Mix and a Jack Lalanne Juicer and they have come out of the closet! Carolyn…ooooh I bet they are so much happier now that they can breathe out in the open air! 🙂 hee hee. So glad you’re reading…come back often! Vita-mixes are beasts, too- I wish I could afford to buy you one, too! 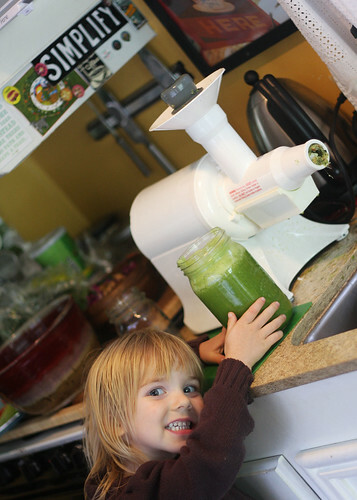 (Mine was a gift from my parents) We love to make juices and smoothies and soups in ours- Eliana pushes the buttons! 🙂 I’m so glad that you have a juicer now- however *large* it is- so worth it!